Dwarf cherry trees are susceptible to many of the same diseases that infect standard-sized cherries. Dwarf cherries are typically created by grafting cherry varieties on dwarf rootstock to limit their mature size. Cherry trees can become infected by a wide range of diseases, usually during overly wet conditions or when the cherry trees are weakened. Some common cherry tree diseases are easier to treat than others, according to University of California at Davis' Intergrated Pest Management Program. Caused by the Monilinia species fungi, brown rot is one of the most common diseases among dwarf and standard cherry trees. Brown rot infects the cherry tree blossoms, causing them to turn brown, wither and die. This disease also creates brown sunken areas around the twigs and bases of flowers, causes the leaves and twig tips to shrivel, and causes the twig bark and bases of dead flowers to ooze a brown, sticky gum. Brownish spots develop on the cherry fruits and gray and velvety spore masses develop on the twigs or flowers. Control brown rot on dwarf cherry trees by pruning away all diseased leaves, twigs, fruits and flowers. Don’t wet the foliage when you irrigate and apply a copper-based fungicide at the pink-bud stage to prevent persistent disease infections. Cherry leaf spot is a foliar fungal disease that creates light-gray or brown to dark-purple spots on the upper surfaces of the dwarf cherry tree’s leaves. The leaves may turn yellow and the spots can dry then fall out of the leaves. Cherry leaf spot can also damage cherry fruits. Treat cherry leaf spot disease by pruning away or removing and destroying the diseased leaves and fruits. Sulfur fungicide applications are necessary only in severe infections. Powdery mildew is a disease caused by fungi that over-winter on cherry trees and release their spores during wet springtime conditions. Powdery mildew on cherry trees is caused by the fungus Podosphaera clandestine and creates a white powdery spore growth on the leaves. The powdery growth sometimes also covers the shoots, flowers and fruits. 'Bing,' 'Black Tartarian' and 'Rainier' cherry tree varieties are the most susceptible to powdery mildew. 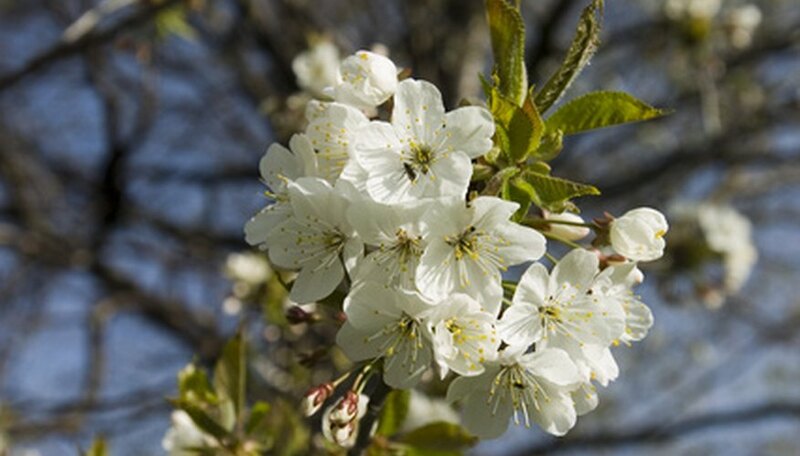 Treat infected dwarf cherry trees by removing and destroying symptomatic leaves, avoiding wetting the leaves when watering and avoiding over-fertilization of the trees. In severe or persistent cases, you can treat the dwarf cherry tree by applying horticultural oils, neem oil or sulfur fungicide. Cytospora canker causes dwarf cherry trees to develop sunken, brown, irregular lesions on the twig, branch or trunk bark, as well as dieback of the branches, twigs and leaves. Cankers may ooze an amber-colored, gum-like substance and orange threadlike structures. Treat dwarf cherries infected with Cytospora canker disease by pruning away infected branches and carving out cankers from the tree until only healthy wood remains. Perform this pruning during summer, and avoid wetting the leaves when watering and over-fertilization. Originating from a soil-borne fungus, verticillium wilt causes the dwarf cherry tree’s leaves to turn yellow, wither and drop. The twigs and branches may turn light-brown and die as the disease progresses, and the fruit growth is usually stunted. Treat verticillium wilt by pruning away and destroying all dead branches, as well as avoiding any excess watering or fertilization. Also caused by a soil-borne fungus, Phytophthora root and crown rot creates darkened spots in the bark, trunk base and upper roots of the dwarf cherry tree. Leaves may become yellow or purplish, reddish-brown streaks may develop on the inner bark, and gum-like dark sap can ooze from the diseased trunk areas. Control this rapidly-progressing, deadly disease by avoiding over-watering or wetting the crown and by cutting away any diseased bark at the soil level. You can also remove the soil covering the tops of the main roots and allow them to dry out.